Indeed, one of the fastest ways to get around town when you’re a solitary traveller is to jump on a motorbike taxi. 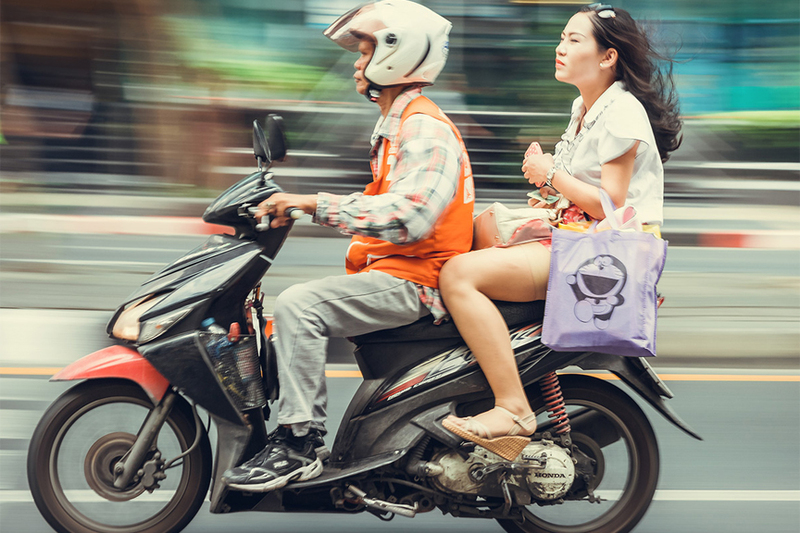 By being able to dodge the almost constant gridlock and dart in and out between cars and buses, motorbikes are a quick way to get around, especially during rush hours. Considering Bangkok’s notorious traffic conditions, it is probably also the most dangerous! 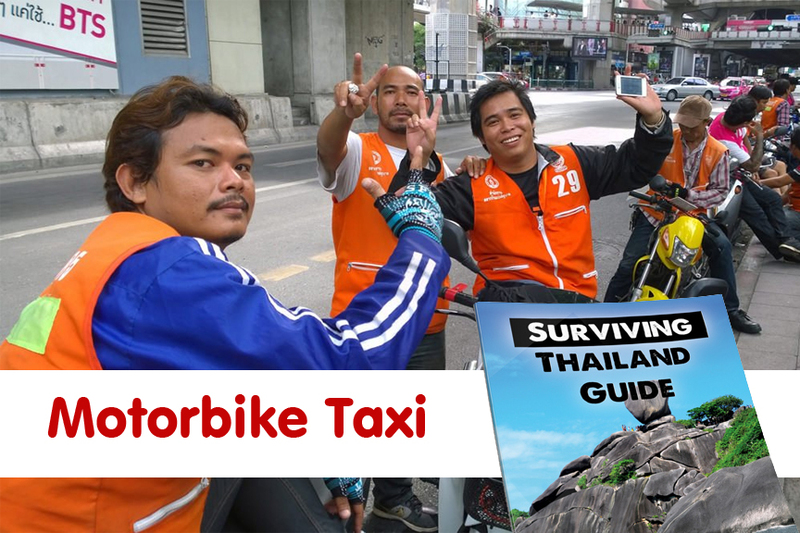 Despite the immediate hazards – fearless motorbike taxi drivers will do anything to get you to your destination quickly, even if it means driving on sidewalks or in the opposing traffic lane! – many brave passengers opt for the two-wheeled vehicles to take them all over town. Motorbike taxi drivers are easily recognised. 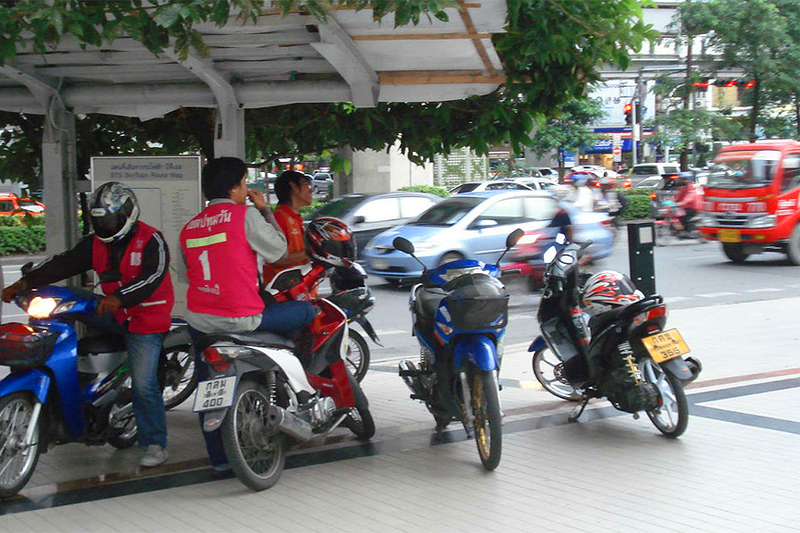 Wearing numbered orange vests, groups of motorbike drivers can be spotted congregating in groups near street corners of office or shopping buildings, busy roads, smaller ‘sois’ (streets), and near Skytrain and underground stations. Fares will start from 10 baht for short journeys, and varies depending on how far you go. For certain routes, the fare will be fixed, and you’ll sometimes see a board displaying prices. But make sure you negotiate prior to the journey, or else you might find yourself paying more than the locals.